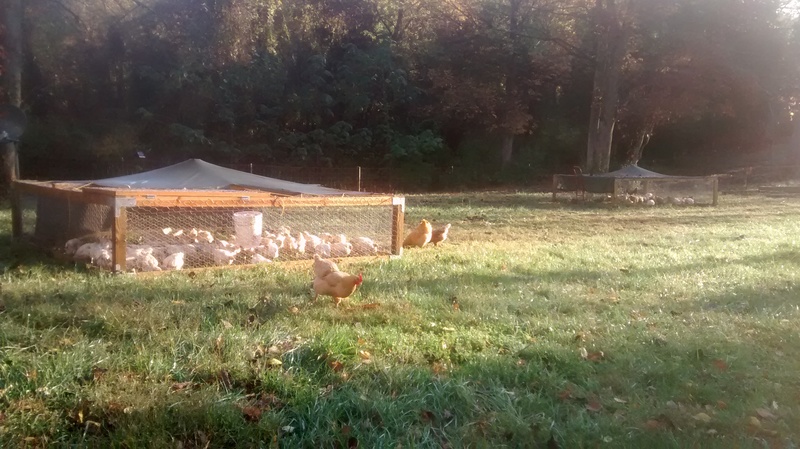 Chicken processing day is this Saturday, and these broiler chickens are getting big! We are now moving the tractor pens twice daily, which gives each batch of 60 birds 200 square feet to forage over daily. We are also giving them plenty of feed to support their growing. 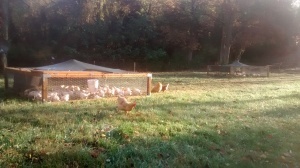 Chicken tractor pens in the morning light. This batch of broilers is doing great in terms of foraging for bugs and eating grass, so the meat should be especially tasty and nutritious. It’s not too late to buy chicken, order now! We also still have a few spots on the processing team, so sign up for that if you’re interested.